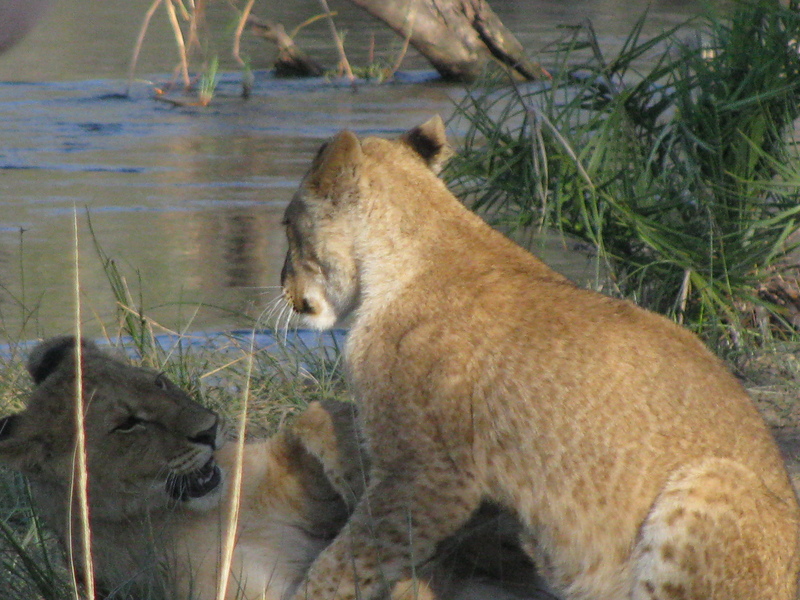 This photo was taken during my walk with lions in Zambia. These two are sisters. I’ll be off for the next few days. I hope all of you have a Happy Easter. My plan is to spend time with family and to relax. Take care everyone and I’ll see you soon. This entry was posted in Africa, Travel, Travel Photos and tagged Africa, Lions, Photography, Photos, Travel, Travel Blog, Travel Journal, Travel Photo, Travel Photos, Walk with Lions, Wildlife, Zambia. Bookmark the permalink. Unfortunately my Easter wasn’t very relaxing. One trip to the animal hospital (my cat and he’s doing better now) and one busted pipe in my neighbor’s flat…well you get the picture. Hope yours was nice! I hope you are right! These types of weekends happen and they make me appreciate the good ones. Have a very happy Easter and a lovely relaxing few days. Great shot of the lions! Thanks! The lions were amazing! Lovely photo! Thank you for your comments on my site, and I wish you a lovely Easter with those you love. Thanks! I hope you enjoyed your weekend. Cats of all sizes are beautiful and fascinating. Thanks Nia. We did that in Mauritius – a slightly intimdating but amazing experience when done in the right capacity (I was just saying to someone I did a lot of research beforehand as many animals involved in these sorts of interactions are sold to canned hunting reserves when they become too big). I believe it’s the same family that runs this in Mauritius as the one in Zambia if my memory serves me right. I can’t believe that some places would sell these animals to be hunted. How despicable. The place we went to in Zambia is helping these lions be reintroduced into the wild (and I hope no hunters will ever get to them). It was intimidating. At one point I was next to the lion, kneeling to touch her fur and the other lion approached. The trainer was frantically whispering for me to stand up immediately since I didn’t see the other approach. She wasn’t trying to hurt me, but saw me as a playmate. I think I would be on the losing end of a friendly game of biting. Fortunately no one was injured and she lost interest in me quickly. I was amazed at how fast they are! Even when they are walking (as youngsters) you have to run to keep up! It was the Bristow’s, the family that runs it in Mauritius. I agree it’s terrible to think that they could end up with such a fate. Unusual that they may be reintorduced to the wild after such close contact with people. They look like they’re having fun. Have a happy, relaxing Easter. Children of all types know how to enjoy life. Excellent photo! I would love to see them up close like that! I hope you do someday! Hi Dina! Thanks so much for the nomination. You are so kind. I wish you fun in seeing the world! I hope the move is going well! that looks pretty up close and personal. Enjoy your family time. Thanks Lynne. Family time is important for us. Enjoy Easter and relaxing with your family! It was amazing to watch them play. They reminded me of house cats playing, except I think they would destroy my flat in the process. How beautiful their fur is. I guess that dappled effect is to camouflage them when they are lying low. How are lions doing in Zambia? I don’t know the actual number of wild lions in Zambia, but I know it is low. Dangerously low. It is such a shame. They are such beautiful creatures and to know that humans are the may cause for their downfall is downright depressing. Good catch … and Happy Easter to you as well. …. and Reds win on Opening Day! That’s great. I hope they have a wonderful season! So sweet…I love baby lion. Hi Novroz. I’ll have to pop on over to your blog to find out the details. Thanks! Oh, that’s very sweet! What a cool photo and a great opportunity to capture this. You used a zoom lens here, right?? That is really close! Great capture. We were walking with them so zoom was not needed. I actually held one of their paws and was able to pet the other one. Fab photo! Warm wishes for a wonderful Easter weekend! Love the coloring of their fur. The fur makes them look so young and innocent. I would have named this photo “Caught in the Act” – very cute! 🙂 Happy Easter. Hope you had a restful time with the family. That is a good title! wow, getting so close! thanks for following! have a good sunday! Nice to meet you via your blog! cheers! see you there or on your blog! Happy Easter to you to ..
thanks! Hope you had a nice weekend! Thanks! It is always good to take a break. So amazing. My sister in law lives in Africa raising orphan cubs.